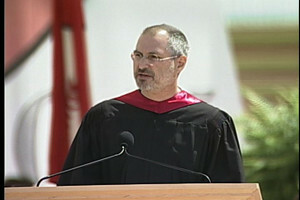 Steve Jobs never finished college, not to mention graduate business school, but he became a legendary business leader. As the world stops to consider the enormous contribution of this visionary, I also was thinking about his legacy, and after fifteen years as an MBA admissions consultant, I couldn’t help but think about lessons for MBA applicants. These lessons are not just about his showmanship, or the laundry list of products he helped to create, or the organizations he founded and grew, or his lengthy battle with cancer and untimely death. I want to look beyond the headlines and the tributes for actionable lessons that you can use in your MBA applications. Impact. No one expects an applicant to have had Jobs-ian impact, but a successful application to a top business school has to show that his or her involvement made a difference. What have you created? Innovated? Grown? It could be a church group. A band. A club. Wherever it was, show how you contributed. Creativity and initiative. As CNN observed “Time after time, he sold people on a product they didn’t know they needed until he invented it.” He had the creativity to invent it — and the initiative to move forward on his plans whether it was the Apple I, the Apple II, the Mac, the iPod, the iPad, or myriad other products. When have you taken the initiative to solve a problem, design a new system, or create a new event? I’m not talking about tons of technical details involved in the process; the tributes to Jobs also aren’t. The creativity and initiative are evidenced by his results–and there’s that word again — impact. Passion. He had high standards and incredible enthusiasm for his work. His zeal for user-friendly technology knew no limits – and I’m neither a techie nor a Mac-head (although I could be undergoing a conversion). In his words, “Our goal is to make the best personal computers in the world and to make products we are proud to sell and would recommend to our family and friends. And we want to do that at the lowest prices we can.” In MBA admissions “passion” means dedication plus action. If you are asked what you are passionate about, think of Steve Jobs’ zeal, and then think of times when you combined enthusiasm with action. Leadership. He led his company. He led his industry. In many respects he led all of us towards a more technological and entertaining world. It’s that influence on others that you want to reveal in any MBA essay on leadership. Again, you don’t have to have led the world or a multi-billion dollar company. If you persuaded your team, your club, your class, you would have exhibited a little bit of what made Steve Jobs the brilliant leader he was. For the next few days, there will be an outpouring of tribute and praise, a recounting of Steve Jobs’ genius and achievements. And then it will die down. I don’t think Steve Jobs will be forgotten, just as I don’t think Henry Ford or JP Morgan will soon be forgotten. But in a few days Apple’s home page will go back to selling its products. His family will do their best to pick up the pieces of their lives. And we will go back to using our Macs, iPhones, iPads, and iPods. And soon, perhaps immediately, you will resume your MBA application process. When you do, apply these four lessons from Steve Job’s super-sized and all-too-short life. This article first appeared on Technorati. Last updated on October 25, 2015.